It is vitally important to understand that schools are not just buildings but social environments that contribute more to our children's education than the buildings alone. As architects we must be aware of the relationship between teaching spaces and social spaces and use this to enhance the learning experience. The architects role is to understand the core principals of the education providers and manage the manipulation of the environments to allow educators to deliver what they do best. 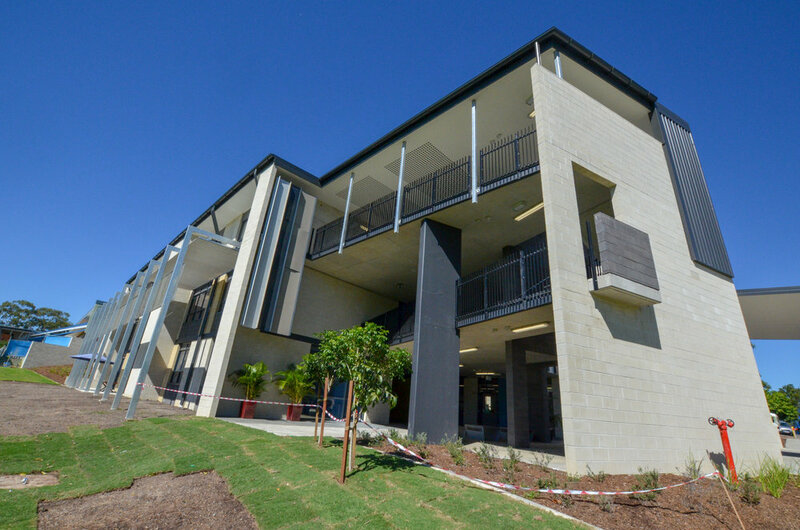 We are very pleased to have an ongoing relationship with ACU at the Brisbane (MaCauley at Banyo) Campus. ACU recognises that a successful modern university campus is as much about the common space activation as it is the teaching space. Providing healthy, active environments that encourage student engagement and interaction is key to enhancing the education experience and retaining student numbers. The relatively new campus has fantastic academic facilities but has under utilised its extensive grounds and incidental gathering and co-curricular spaces. Working closely with key ACU stakeholders Resonance d+a recently completed a number of interconnecting projects to provide additional amenity within strategic locations throughout the campus. Once again we are very pleased to have been invited by ACU to provide the design for this exciting little project. 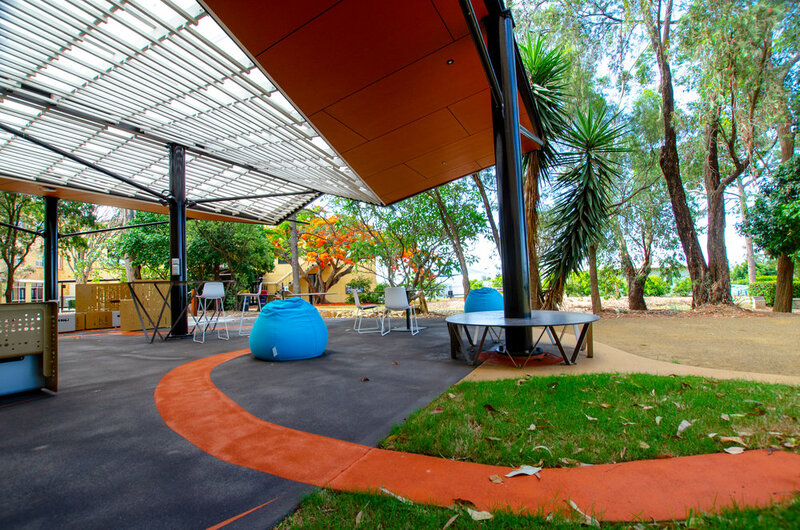 The Weemala outdoor learning area is a dedicated space for the indigenous support centre at ACU. 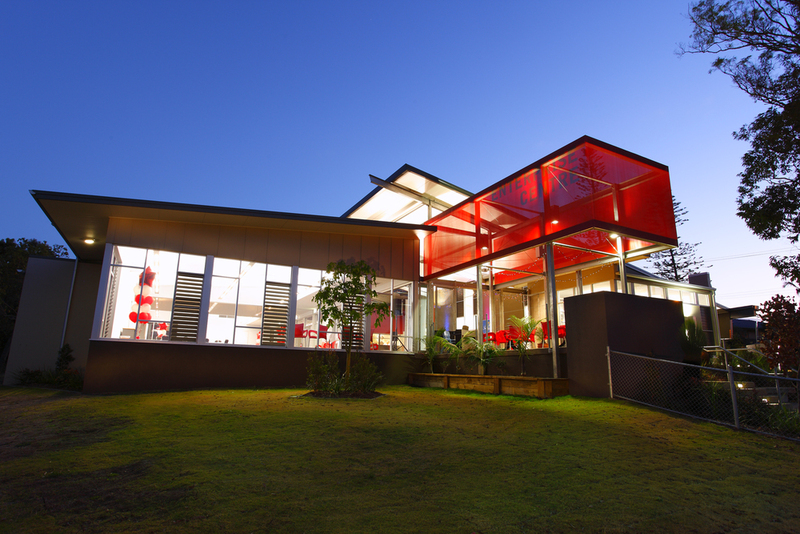 This project utilises an existing slab and shade sail structure and updates to a new solid roof reflecting a bird, (inspired by the local tribe animal the Black Duck). 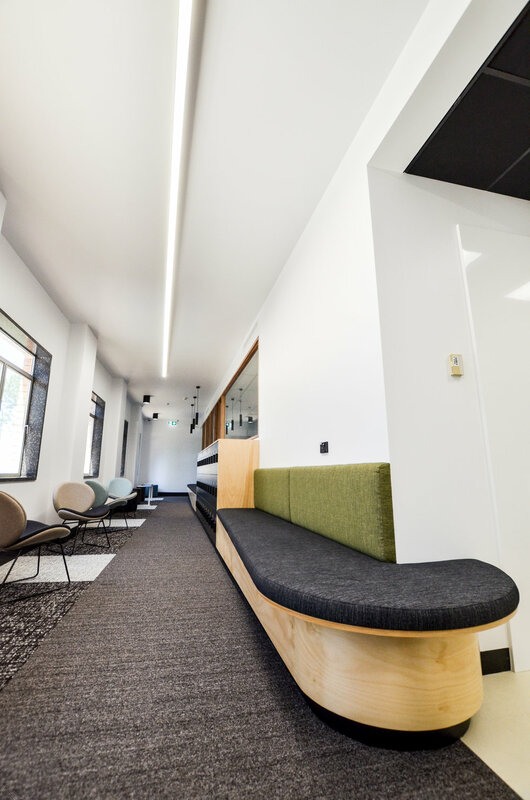 The existing concrete has applied finishes that introduce song lines from the Weemala artwork and brings clearly identifiable Aboriginal and Torres Straight Islander imagery to the space. The space is intended to be a comforting and secure space that provides for teaching, meeting, functions and general relaxation. The works extend into the landscape and include aspects form the artwork reflecting the land, forest, river and reef. 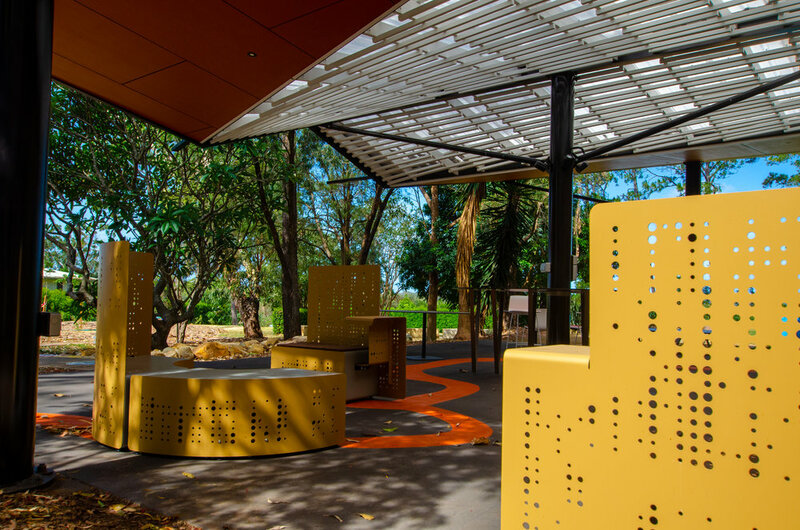 We have designed custom made mobile and modular furniture from perforated aluminium and timber that provides the opportunity for a variety of functions, including screened private tuturial / meeting spaces or more open social engagement. Built in seats and central bar are complimented by mobile tables and chairs and even outdoor beanbags within the wi-fi range extend the habitable zone well and truly into the landscape. As part of their major works to co-locate the school of nursing, the second floor wing of building 207 was been freed up for alternative uses. This involved a complete gut and refurbishment of 400m sq on a long, middle floor north facing section of the main campus building. The new works constitute additional sessional staff facilities including 35 desks, breakout spaces, 3 new teaching rooms and 2 new meeting rooms. 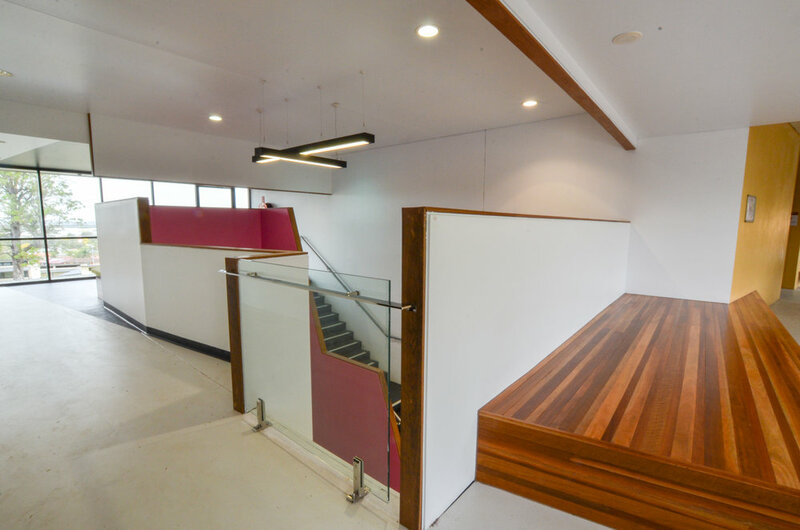 The project opens up the existing wing with an extra wide hallway incorporating built in seats and benches with GPO and USB outlets to encourage students to inhabit the movement spaces. This space hugs the northern wall with existing windows (complete with terrazzo windows jams) and links through glass doors to the sessional breakout zone. 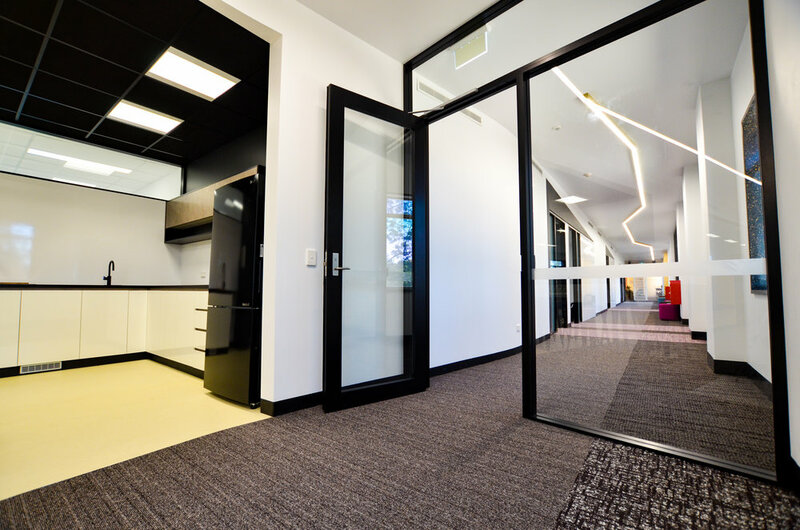 The hallway has a subtle angle that widens at the start to accommodate larger numbers of people and narrows towards the private sessional office space. This act also makes the corridor feel less like a hallway and allows greater habitability. the inclusion of seats and benches with mobile soft stools further enhance the relaxed and usable space. Entries to the teaching spaces are highlighted by door recesses with large common space whiteboards and a feature squiggle light. The meeting rooms are accessible to the wider campus and include writable glass walls and much needed tele conferencing facilities. 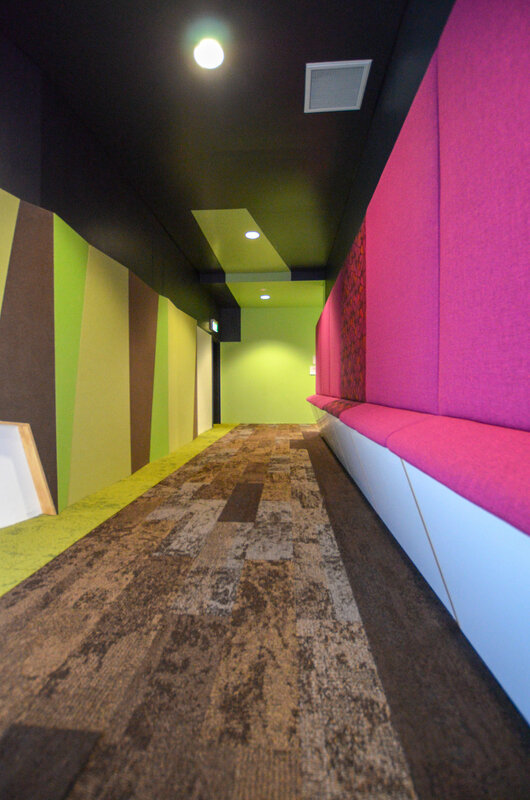 The built in plywood furniture and colourful soft furnishings provide a warmth to the breakout zones with a timber and glass screen that buffers this zone to the working space while still allowing borrowed northern light into the office space. 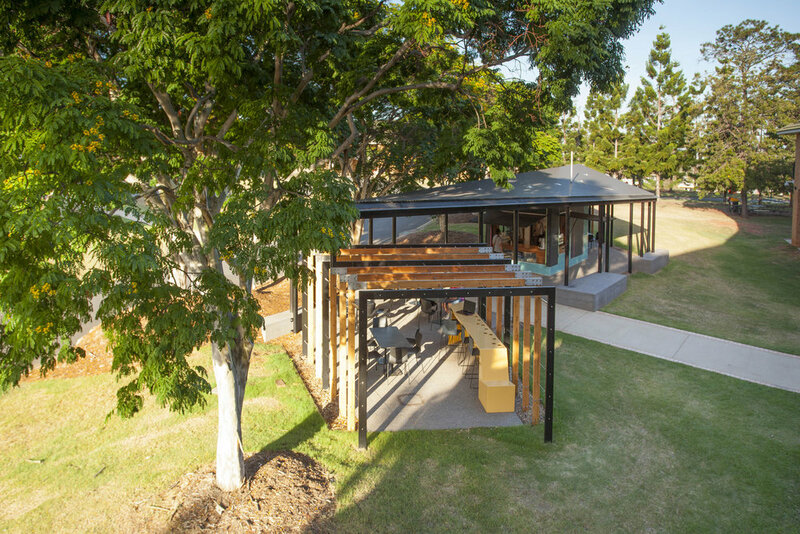 As part of ACU's health science precinct and their aim to engage with the community and encourage an active student lifestyle the lower oval was upgraded to a class A playing surface with new habitable viewing spaces around the edge. 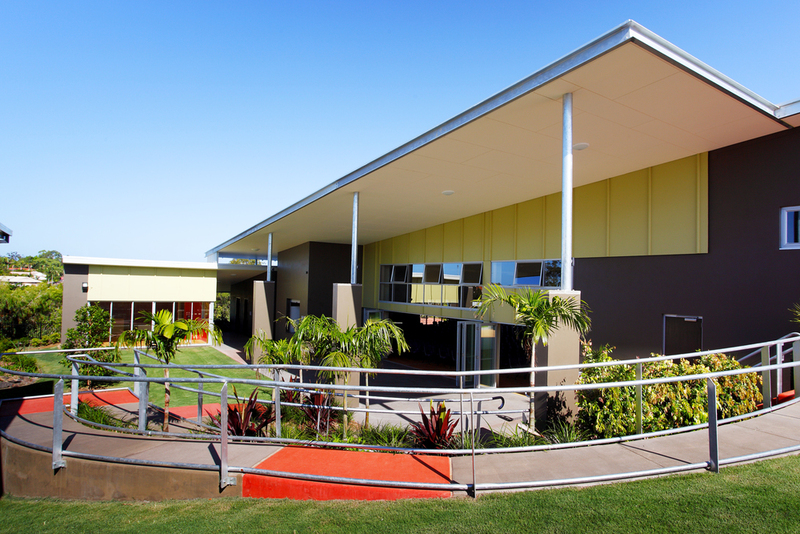 These works included a significant amount of in ground services and stormwater re-direction, collection for irrigation, new competition grade oval lighting for night time events and a covered terrace seating area adjoining the health science block. 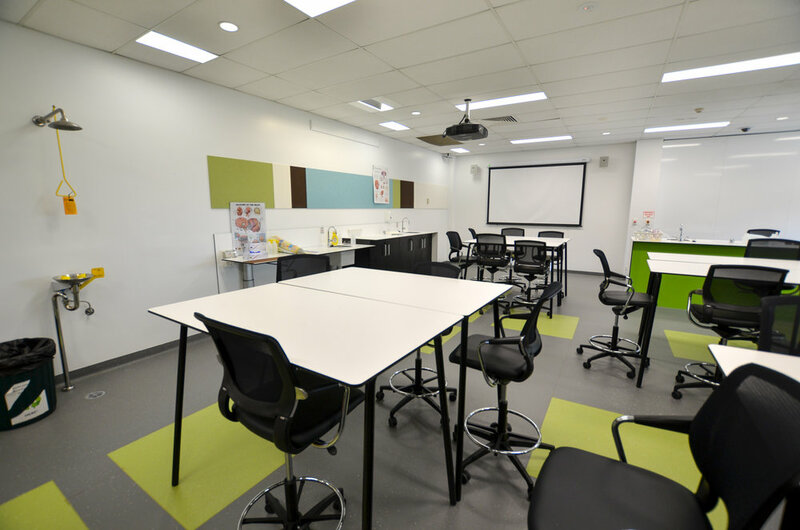 While these new works were intended to provide destinations in an otherwise under utilised zone of the campus they also provide a direct connection to the internal teaching space and have been designed for multiple uses. 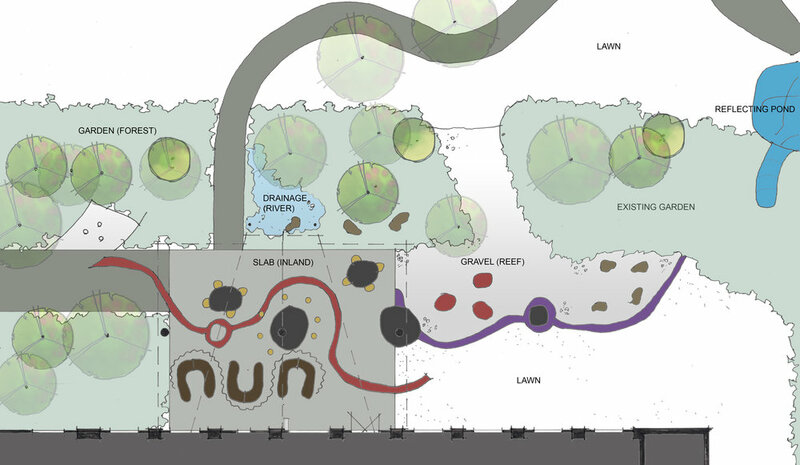 From the inclusion of power charging and wifi connection, terraced seating for viewing of the oval through to flat spaces for teaching purposes and a direct connection between O Block and the oval itself the new works promote a crossover between the active and passive spaces and revitalize a neglected area of the campus. The junction coffee hub is strategically positioned outside I block and the lecture halls to provide a decentralized catering option for the campus. 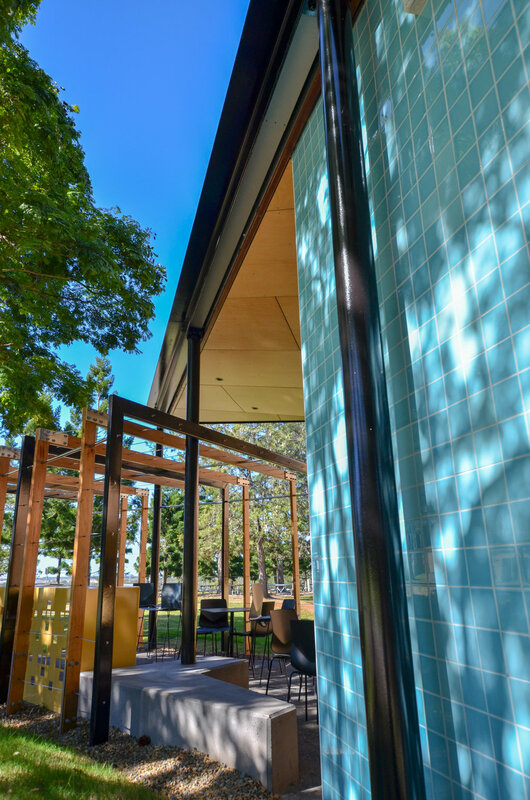 Designed to hug the edge of the forecourt and tree line the coffee hub provides much needed shade and caffeine at the entry to one of the busier Blocks on campus. The junction is set against the heritage listed Administration building and aims to provide a counterpoint while subtly referencing the patterns within the existing building through the tiling layouts and cutouts in the folded metal seats. The blackboard walls of the cafe fold down when not is use to allow an open covered space complete with power and wi-fi. When the cafe is open it addresses the main access path and provides an active and shaded edge to the building forecourt. Resonance d+a was commissioned to re-invigorate the common space and hallways of I Block. The existing concrete floors and Beige rendered block walls were dull and noisy. 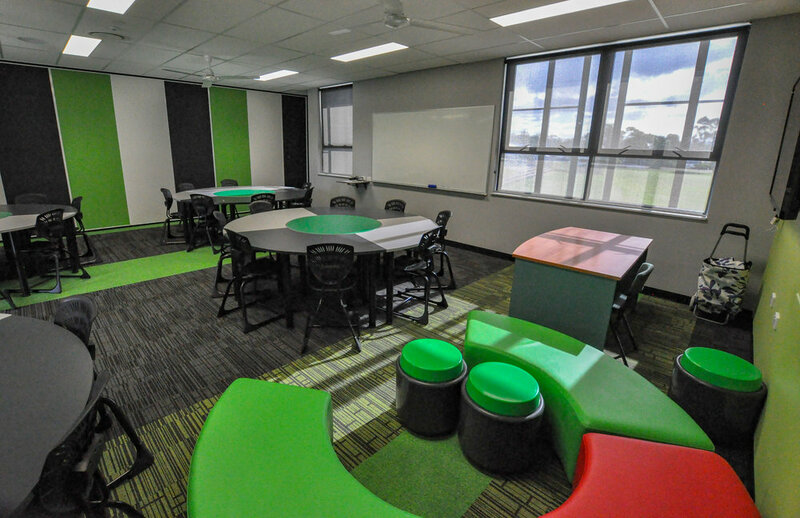 Part of the works was to soften the space and provide some acoustic absorption and resting spaces between classes. 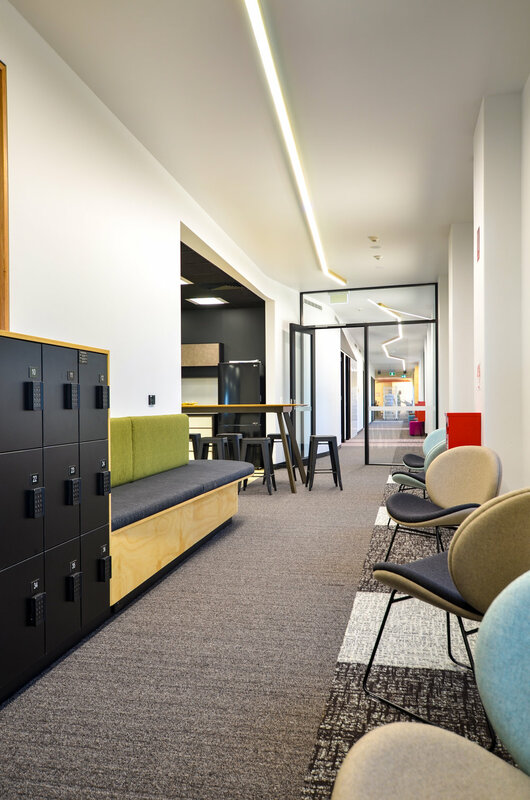 Through the introduction of seating, pinboards and magnetic whiteboards throughout and a few splashes of colour the new space allows itself to be manipulated by the users for the users. This project involved repurposing an existing generic DET 70's GLA building into a new Administration building. It was to become the front of house for the public access to avoid the need for public entry into the school and give a new face. The school request was to have something neutral and modern while inviting. The main challenge with this project was to remove the stigma associated with the existing building and turn it into something exciting. To do this we lined the internal exposed trusses to maintain the volume but provide clean lines throughout. New lights are suspended between the trusses to modernise the space and hide the services behind. 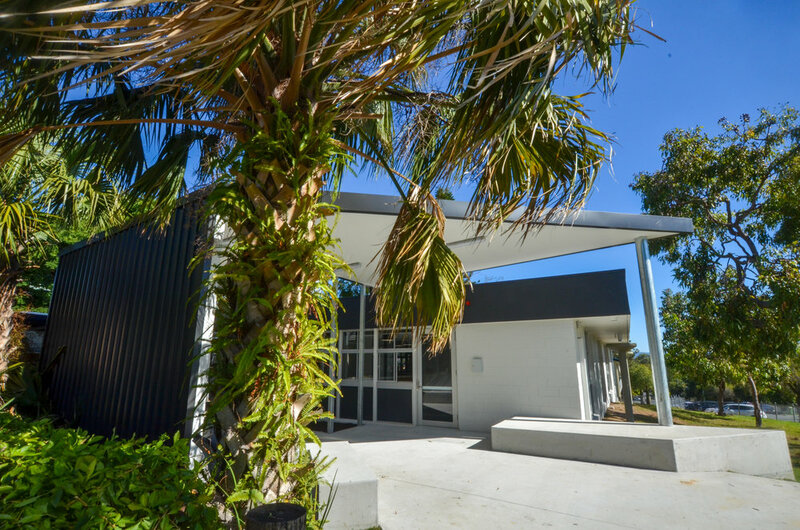 A new entry structure opens up to the street exposing the entry while providing a covered seating area for parents on arrival and students while waiting for afternoon collection. This zone acts as the filter between the public street space and the private school yard. The reception area also has 2 entries, 1 for public 1 for student while be serviced from the same desk. This provides a separation of function while maintaining efficiency of resources. The tones are kept neutral in the base structure to set it apart from the rest of the school and to allow identity to be driven by furniture, signs and installations. Aquinas College has a reputation of delivering a quality curriculum but until recently did not have the facilities to match. As is the case with most schools minor additions and makeshift alterations had been the general course of action to accommodate shifting needs. With student numbers set to double within the next 3 years we carried out a complete audit of the existing facilities to determine what would be required and when. Coupled with the quantity issue we undertook a quality audit to identify how future works could improve aspects of the school that had been neglected over the years and provide an image of the college that more accurately reflected the quality education it provided. Due to the massive amounts of work required to accommodate the new numbers the master plan was staged over 10 years to allow for continued operation and budget control. As part of the master plan precincts were identified to be re-invigorated at each stage so sections of the college could be closed or opened to minimise disruptions to general day to day operations. These the new insertions were also to assist with improving the existing facilities through improved connections and permeability, linking courtyards and providing more human scale and softer, shaded gathering spaces. As part of the new works there was a desire to try and integrate an aesthetic across the site to create a more unified appearance and incorporate a more tertiary orientated feeling to the spaces. The cultural precinct is located on the eastern side of the site and has a secondary street frontage. The existing Arts Building and Drama Centre were somewhat removed from the main circulation of the college although provided the opportunity to create a separate street entry with a new active cultural hub. Consisting of 2 new teacher kitchens, hospitality kitchen, textiles room, restaurant, 6 teaching spaces and a covered sports facility the new works formed a binding layer to all the cultural elements to create a unified precinct. The new buildings were created to envelope the existing structures and open up a new courtyard back to the main movement paths of the college. Due to this area being off the main access route the negative space creates a juxtaposition to the main movement path and activates the change in direction. 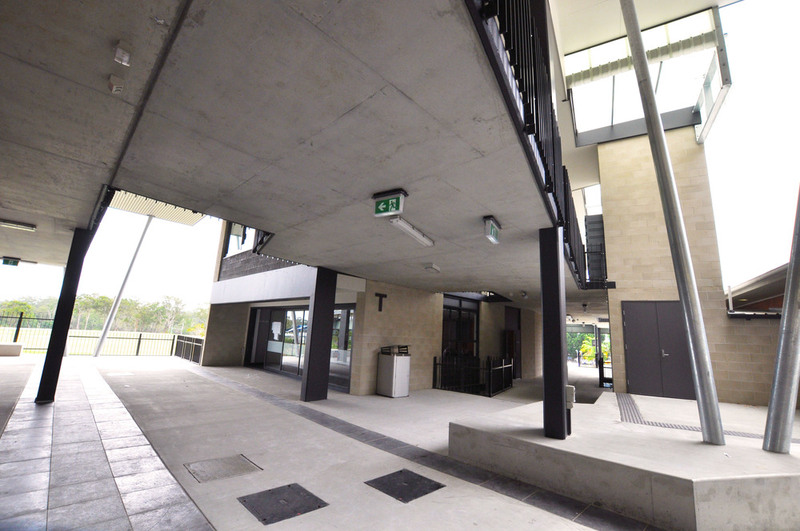 A new entry off the secondary street provides both student access and separate public entry for function nights. Located at a change in level the 2 and 3 storey buildings seamlessly connect the different ground levels to enable easy access to the new covered sports facility. Designed to allow future enclosure, the Covered Sports Facility will become a Performing Arts Centre that integrates with the arts and hospitality services. With the eastern part of the site (stage 2) now open the stage 3-4 works takes over the western side to become a science and technology precinct. By bringing the often neglected manual arts into the mainstream the 3 new workshops, CAD room, 2 science FLA's and additional 12 teaching spaces close off the western end of the site. Covered cascade seating connects the existing and new courtyards with the added bonus of providing external provides teaching space, lunch time recreation, outdoor performance and house meeting area. Using a similar aesthetic and layering of spaces the stage 3-4 works provides a bookend from the oval against the stage 2 works and integrates across the site. 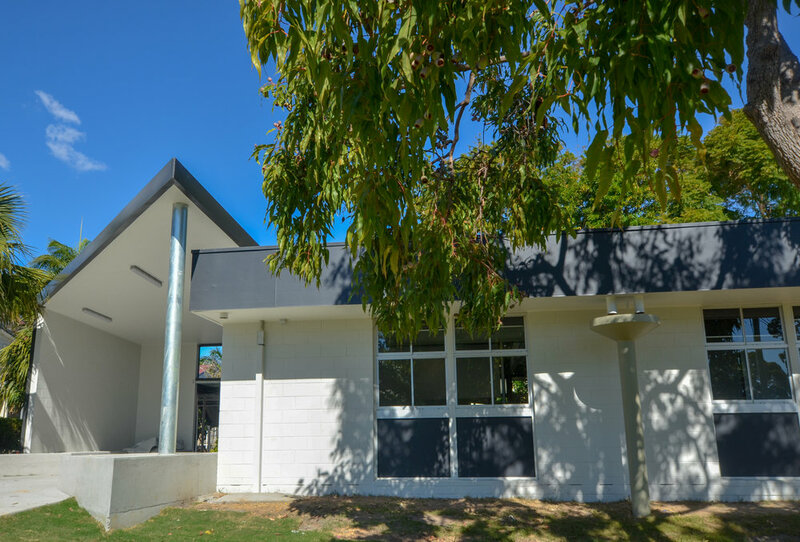 The stage 5 works is to update the administration building and expand the resource centre to suite the advanced technology opportunities and teaching methods. Located at the front of the site these new works are going to remove small tack on elements and re-introduce the magnificent 60's entry feature as a reflection of the schools proud history. New 2 storey elements will create a stronger street presence and provide well monitored student gathering spaces. 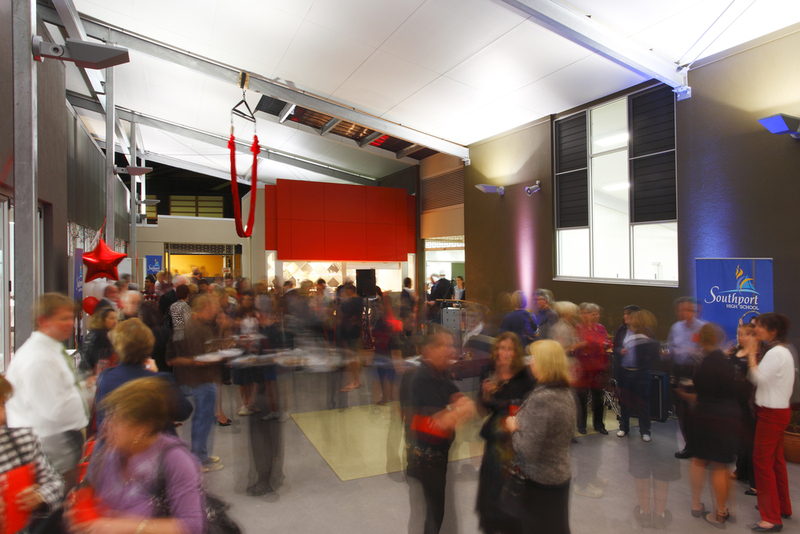 Robina Community Performing Arts Centre acts as an interface between the school and public. 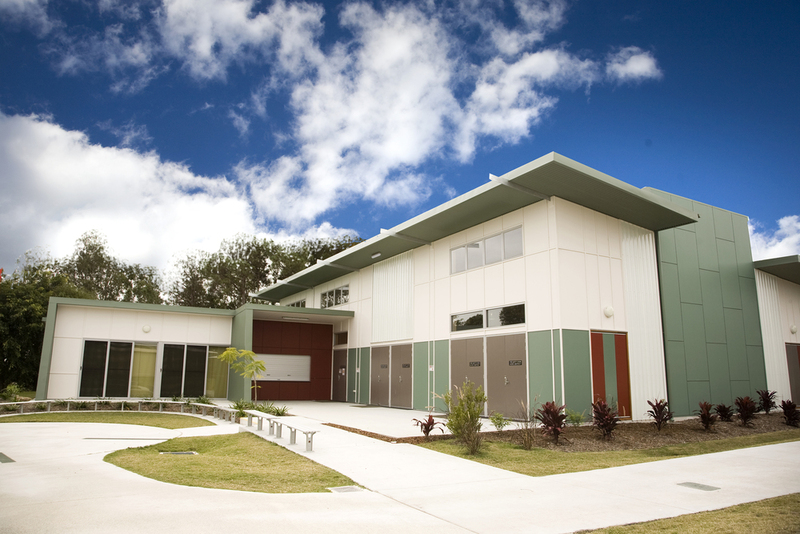 Afforded a secondary street frontage the centre provides direct public access to engage with the community and after hours access independent of the school operations. 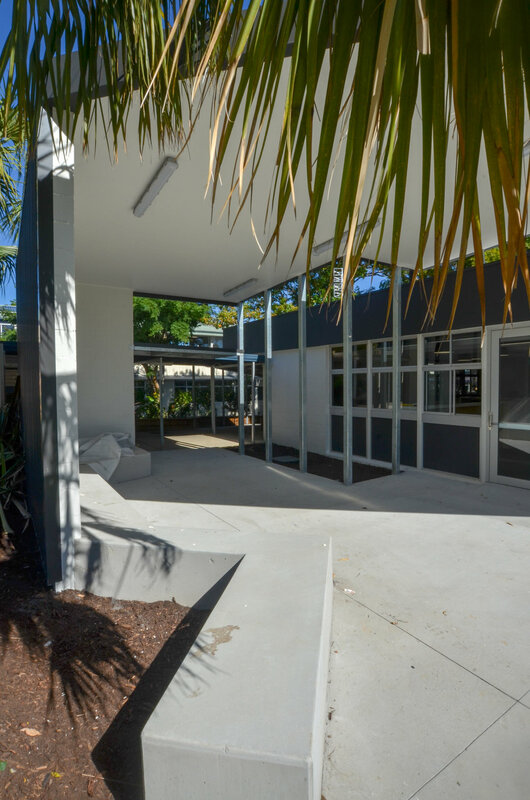 A north facing courtyard provides hard and soft surface play and recreation space that connects directly into the secure school network. The link network continues through the centre to the on site secure drop off zone. Located on a hill the design of the centre takes advantage of the slope to enhance the functionality and comfort. 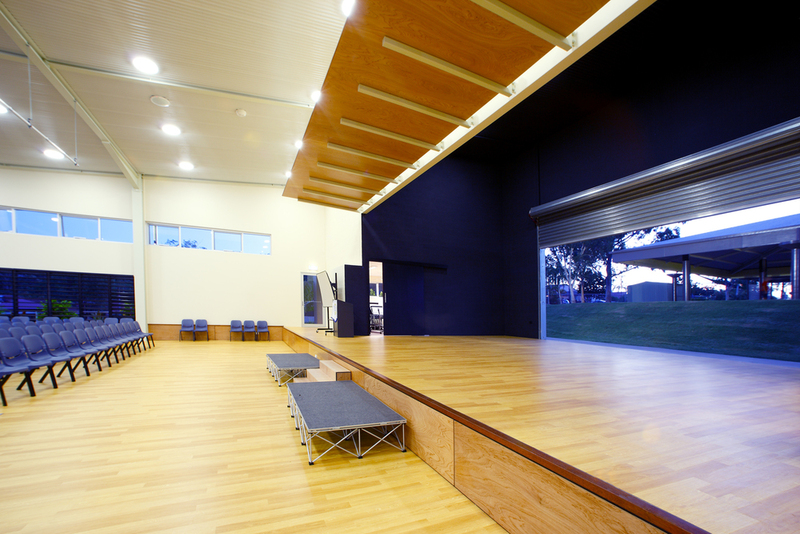 The stage includes a full height operable shutter to open up the back to a grassed amphitheatre. The eastern louvred wall overlooks the oval and collects all the cooling breezes to scoop through the main hall. Large bi-fold doors open to the northern forecourt to provide a seamless transition between the internal and external space. Receiving both peer recognition and client praise the Robina CPAC is indicative of how good design can achieve great results on an extremely modest budget. All education projects listed below were undertaken as Design Director for Lightwave Architectural. All images courtesy of Lightwave International. The Enterprise Centre is an integrated hub of private and public domains, where inside merges with outside in this state of the art facility. With a striking public face the centre provides a professional complex that showcases Southport State High as a school looking beyond traditional teaching methods. 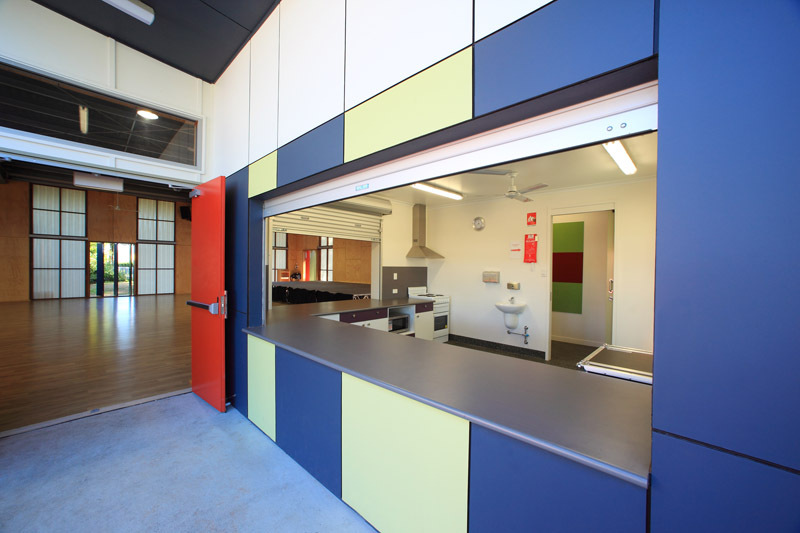 Incorporating a commercial quality kitchen, conference rooms, dining space and classrooms into a multi-purpose and adaptable enclave the Enterprise Centre serves current school requirements while providing quality spaces for community use as well. Building the education revolution projects were a fantastic opportunity to provide much needed facilities to long neglected schools. We were lucky to be involved with numerous projects and are pleased to say they were all very well received and provided renewed energy into the local communities. There were of course challenges along the way, so the trick was understanding where the blocks were and how to overcome these to deliver what the clients needed rather then what was being dictated. Being involved with 1 builder for a large number of these projects enabled us to develop construction techniques and solutions that were both cost effective and repeatable to suite different applications and requirements. Understanding the bureaucratic process also allowed us to massage the brief to achieve both the political agenda and each schools individual requirements. Challenging strict DET guidelines we developed a system to provide ample natural daylight and ventilation that was affordable and durable. Avoiding the use of low level glass full height strips of reinforced fiberglass provide an even distribution natural daylight without the glare. The light play at night reverses with the fiberglass strips lighting up to indicate publicly the hall is in use. Ventilation is achieved by a series of tall multi-coloured narrow pivot doors between the fiberglass strips. Fitted to allow the panels to be set at a variety of angles to catch and direct the breezes they also form a changing and playful façade.